Come play with us at GAMEACON in Atlantic city! We will be there October 20th and 21st at Ocean View Resort and Casino. We will have tables setup to play our game. Swing by and say hello! What a finale to an amazing 30 days here on Kickstarter! You guys really wanted that Single Player mode - Or, as we now call it, Single Player/Co-Op Mode! And now it’s going to be included in every copy of Super Hazard Quest ordered on Kickstarter! We can’t wait for you to try it. It was really the fans that pushed us to this level - sharing us on Reddit and Facebook these past few days. We’ve grown so much in one week! Over $50,000 from over 1000 backers - it goes beyond the success we'd dreamed of. And now it’s real. Prototypes will be sent to the printers tomorrow and we’ll let everyone know as soon as they’re on their way. Thanks again - to each and every one of you. Of course, we’ll be sending you all another digital Thank You soon enough. But hey… We just can’t thank you enough! Last chance to get in on the extra rewards and stretch goals on Kickstarter! Sprite's and Dice Article about Super Hazard Quest! Click to read the great article by Sprite's and Dice! A great in-depth look at our game. Thank you Adam for playing and Sprite's and Dice for the shout out! National Tabletop Day! Come Celebrate with us! Ben and Mike are splitting forces to celebrate National Tabletop Day with as many people as possible. Ben will be at Indiecade giving a presentation about our game while Mike will be 100 miles away in Connecticut playing the game with as many people as he can. If you're around come visit! And as always please share and support our Kickstarter! Thanks to everyone at PAX East! Huge thanks to everyone from Pax East who supported us this past weekend! Few things have been more rewarding than watching players enjoy the game and then back us immediately afterwards. Also, congratulations to our four raffle winners. Thanks for supporting us, and hope to see you all next year. We’ve had an incredible 5 days here on Kickstarter and are hoping to have another incredible 25! With everyone’s help, we’ve already gotten over 10K from more than 200 backers. We’re on our way! After much testing tweaking and testing our work has paid off and we can finally bring you Super Hazard Quest. The card game that plays like an 8-bit side scroller. Please share us, we have a great game and want to make sure people see it! WE WILL BE IN THE TABLETOP AREA. SWING BY FOR A GAME, AND GRAB SOME FREE BUTTONS!!! SUPER HAZARD QUEST's FIRST WRITE-UP IN THE iDIGITALTIMES!!! Imagine a board game version of a 2D dungeon crawler, complete with mini-bosses, checkpoints, and more. Based on what I played it felt like Super Hazard Quest was fresh off a store shelf. 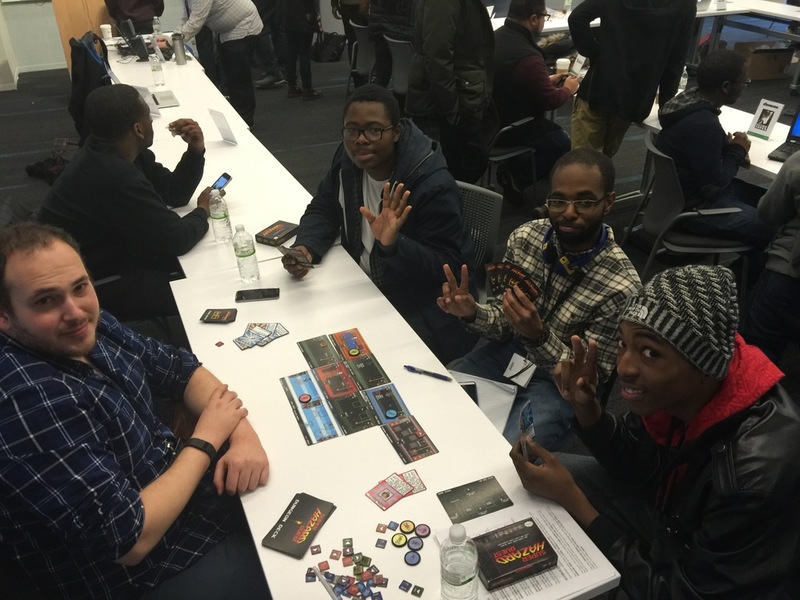 Big thanks to everyone that stopped by our tables at the Game Devs of Color Expo this weekend at the Microsoft Center! A lot of fun games, and new friends were made! Thank you to our test gamers! 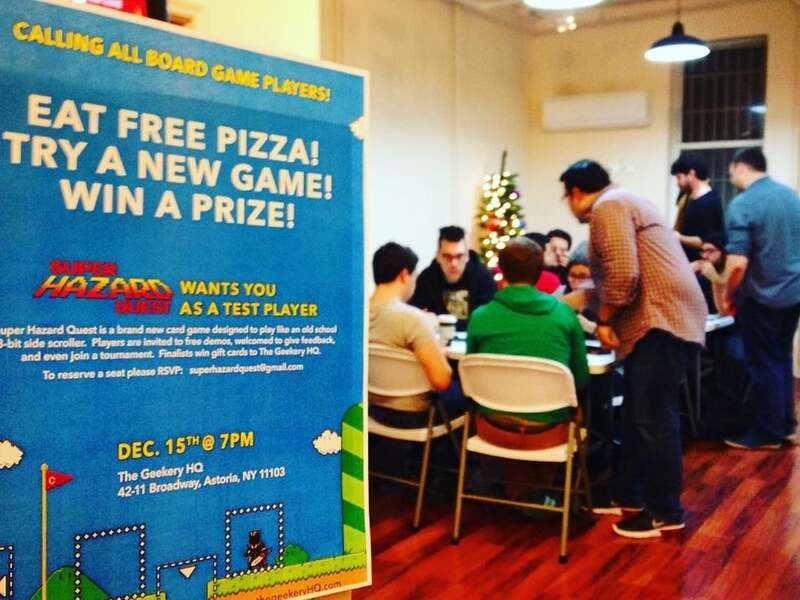 Back in December we had a game testing session at our friends TheGeekeryHQ in Astoria, NY to have another demo and play test of the latest version of our game. We even held our first tournament for prizes. Thanks again for everyone who came out, it was so useful for us and we plan to do it again soon. 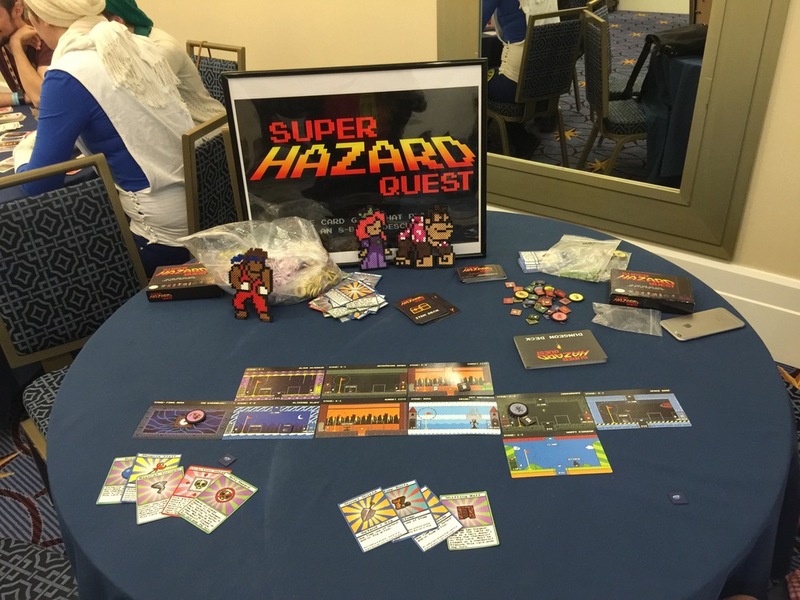 We’re incredibly excited to announce the launch of the Super Hazard Quest website. 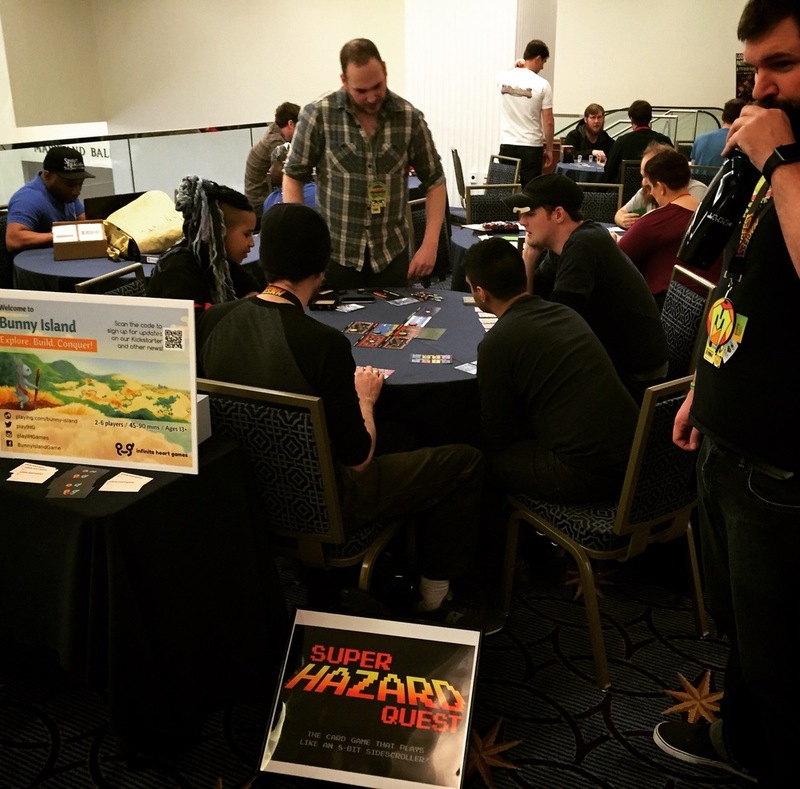 Over the past few months, we’ve been finding conventions, running demos and revising rules. All in the hopes of making Super Hazard Quest the best game it can possibly be. So far, the feedback has been overwhelmingly positive and we’re happy to announce that (after taking your feedback into account), the game has gotten even better! With our latest build coming to MAGFest this February, we’re hoping to hit Kickstarter as quickly as possible. So signup for our mailing list today! Don’t worry, we’re not going to spam you with updates every day, or even every week. The only email we’ll be sending is the one titled KICKSTARTER LAUNCHED. Many of our rewards will have limited quantities, so make sure you’re in the know!